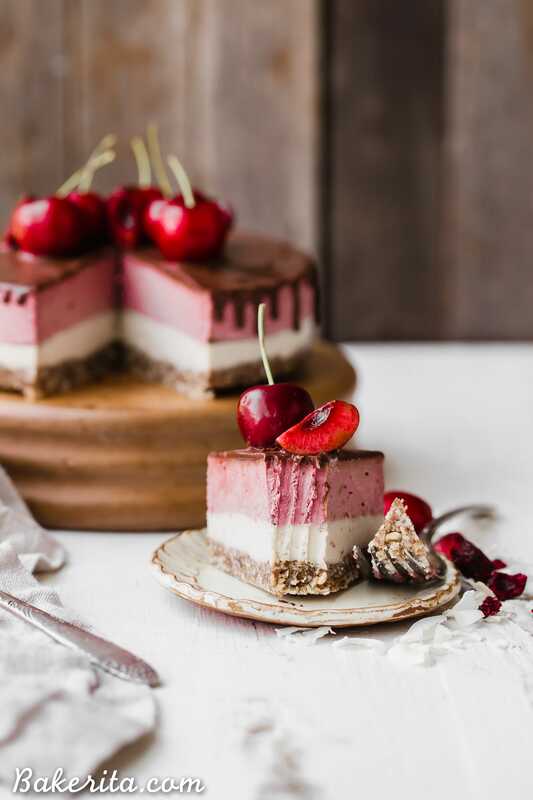 This No Bake Cherry Cheesecake has a pecan coconut crust, a layer of creamy vanilla bean cheesecake, topped by a layer of vibrant cherry cheesecake. Vegan dark chocolate ganache is spread all over the top! You’ll go crazy for this gluten-free, paleo, and vegan treat. Hello, my beautiful friend! Thanks for stopping by today :) I hope you’re doing wonderfully. I’m just hanging out at the coffee shop in my building, doing work – it’s the best thing ever to have a coffee shop so close to sit, camp, and do work with my tea. There are always other self-employed folks here too, so it’s like our little co-working space, haha! Anyways, enough about the coffee shop – CHEESECAKE !!! It’s been a hot second since I’ve posted a delicious no-bake cheesecake recipe…and I figured it was about time to change that! 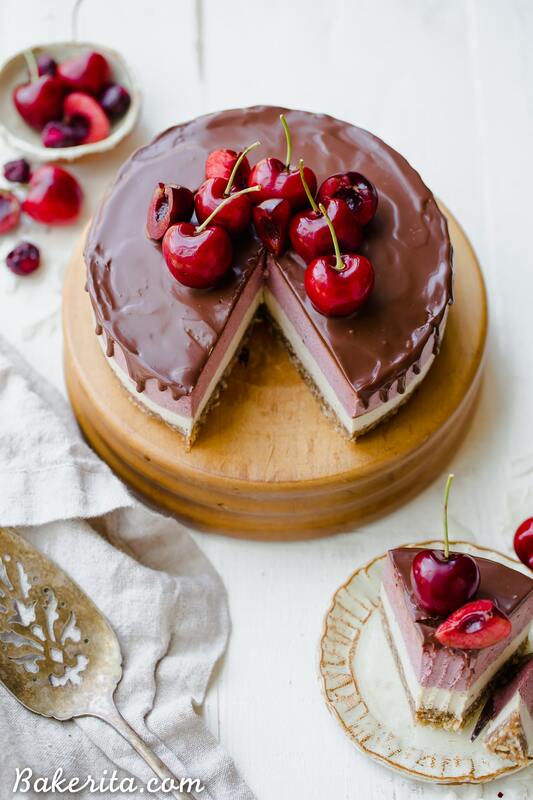 Cherries are generally underrated in my opinion – they certainly don’t get their fair time to shine on this site, and I never see too many drool-worthy cherry recipes floating around the web. BUT they look so shiny and vibrantly gorgeous at the farmers market right now, I had to make something that they could adorn. 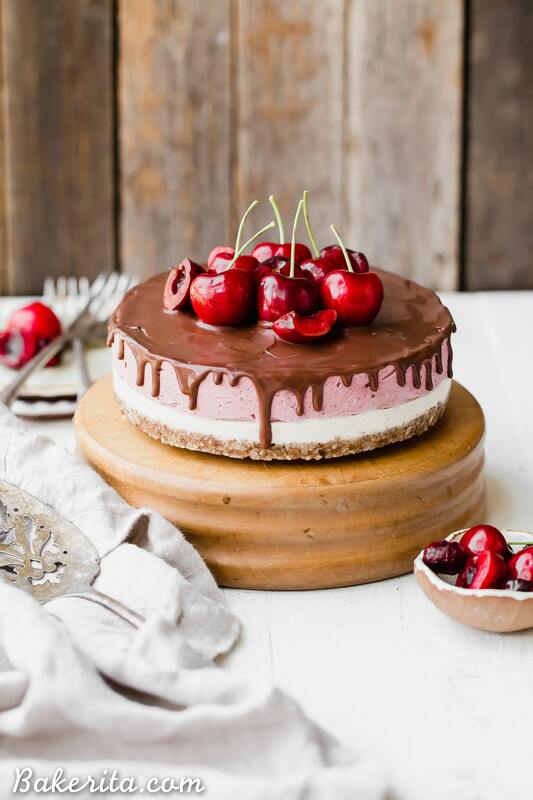 Enter: this no-bake cherry cheesecake. 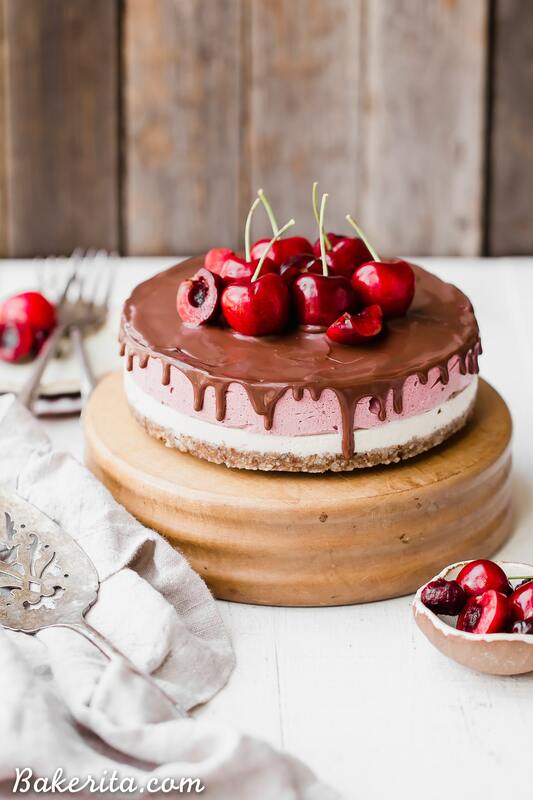 It’s has a simple pecan, coconut and date crust, with a layer of creamy vanilla bean cheesecake goodness, topped with a vibrant layer of cherry cheesecake. It’s all topped off with a chocolate ganache that drips down the sides oh so decadently…and then lots of fresh cherries on top, of course. The recipe is quick and easy to make, thanks to a Vitamix – the crust and filling are both made in there! For the crust, the ingredients are simply pulsed together and then pressed into the pan. The filling isn’t any more difficult – just blend everything up for a few minutes until it’s super smooth, pour half over the crust, and then add freeze-dried cherries to the rest and blend to give it that gorgeous color and cherry flavor. I get my freeze-dried cherries from Nuts.com! Once that’s all frozen, a quick and easy vegan chocolate ganache (made with coconut milk!) is spread over the top – you can let it drip down the sides for a decadent look. I actually piped my drips because I wanted to make sure it turned out ~beautiful~ (how’d I do?!) but you definitely don’t need to go to the trouble of doing that if you don’t want to. 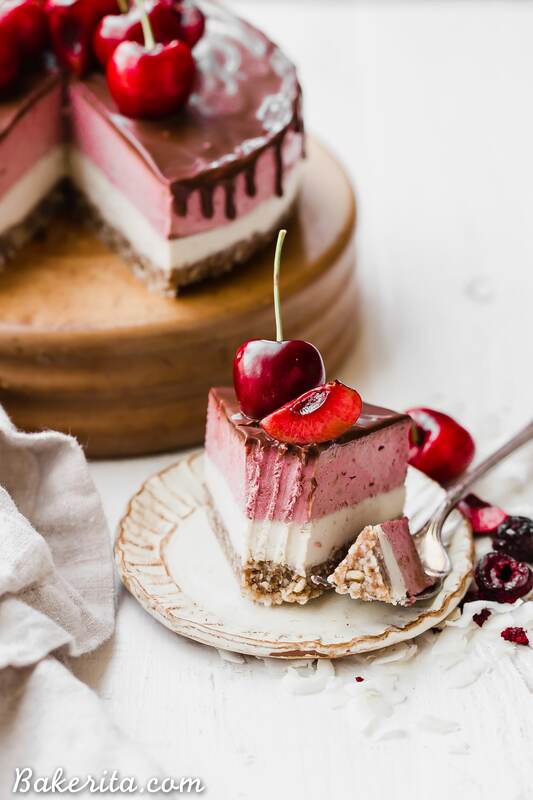 This No Bake Cherry Cheesecake has a pecan coconut crust, a layer of creamy vanilla bean cheesecake, topped by a layer of vibrant cherry cheesecake. Vegan dark chocolate ganache is spread all over the top! You'll go crazy for this gluten-free, paleo, and vegan treat. 1 teaspoon vanilla extract or ¼ teaspoon vanilla bean powder I prefer the powder! Add the coconut, pecans, pitted dates and salt to a food processor or high-powered blender and pulverize until it comes together into a sort of sticky dough, with small pecan bits remaining. Press the coconut-pecan-date dough evenly along the bottom of the prepared pan. In a high-powered blender (I used my Vitamix, but most powerful blenders should do the job), combine all of the filling ingredients except for the freeze dried cherries and blend for about 2-4 minutes, or until the mixture is silky smooth and super creamy! You may need to add a bit more coconut milk or lemon juice to get it to blend smoothly if your blender isn’t super high-powered. Pour half of the smooth filling into the prepared pan over the pecan crust. Smooth out the top and tap the pan hard against the counter a few times to release any air bubbles. Place in the freezer. Meanwhile, blend the freeze dried cherries into the remaining half of the mixture until it’s smooth and dark red in color. Let the bottom half freeze for about 30 minutes or until the top is hardened enough that the next layer won’t sink down into it. If you don’t care, you can do the second layer right on top without freezing between. When the bottom is frozen, blend the mixture again quickly to resoften it (add a little extra coconut milk if it seems to have firmed up too much) and then pour on top of the vanilla layer. Once again, smooth out the top and tap the pan hard against the counter a few times to release any air bubbles. Return to the freezer to set for at least 3 hours or until completely firm. For the chocolate ganache, place your chopped chocolate in a small bowl. Heat the coconut cream in a saucepan or microwave until simmering and pour over the chocolate. Let stand for 3 minutes and then whisk until smooth. Spread over the top of the cheesecake, letting it drip down the sides as desired. I actually did my drips with a piping bag because I wanted them to look really nice, but this is unnecessary - solely for aesthetics. Garnish with fresh cherries! Store in the refrigerator or freezer. I recommend running your knife under hot water to warm it up before cutting the cheesecake with the still-hot (dried) knife. If serving from frozen, let thaw at room temperature for 10-15 minutes before serving. Store in the freezer for up to 2 months or in the fridge for up to 5 days. Oh my I must make this like now!… i have fresh cherries … any suggestions for subbing with fresh cherries? Hi Nikki, it will likely change the texture of the top layer a little bit because of the added moisture but I’d start with about 1/2 cup pitted cherries and see how that looks/tastes :) enjoy!! I love them too! Thanks so much for the love Brittany. Hi, Can i use freeze dried cherry powder instead of cherries? if so, how much would i need? Hi Angela, for sure! Hmm, not exactly sure what the equivalent amount would be, but I’d try adding 2-3 tablespoons, blending, tasting, and adding from there to suit your tastes :) enjoy! do I need to use a 6″ pan? Will an 8 inch pan work or should I double the recipe? I would double the recipe since just that 2″ actually just about doubles the surface area of the pan (29 sq. inches –> 50 sq. inches!). You don’t want to have a super thin cheesecake so I would definitely double. Enjoy! I need this in my life! The chocolate drizzle is so beautiful! Thank you for sharing. I can’t wait to try this! Thanks for the love, Whitney!